Signia started as a branch of the manufacturing giant Siemens, and in 2015, Signia was acquired by the Sivantos group. As part of this German company, Signia belongs to a group which develops and manufactures a quarter of the hearing aids used across the globe today. Remaining connected to Siemens’ hearing aid division, it has a backing of 140 years of knowledge in the hearing device manufacturing industry. And now, is working to further develop its strengths and maintain its technology leadership in this fast-changing field. Life with Signia not only sounds brilliant, but it looks brilliant too! Signia strives to be the best in the hearing aid industry by producing cutting edge technology that not only sounds good, but looks good too. With its latest innovative and stylish hearing aid, the Styletto, Signia continues on a well-trodden path of product quality and inventing the future of better hearing. > Styletto – resembling a piece of jewellery this is a Slim RIC style of BTE. The higher the performance level, the more features you will find on the hearing aid and the more programming ability your hearing healthcare professional will have to customise your device to suit your specific needs. Some people have complex hearing needs. If you fall into that range, higher performance levels will provide more solutions, delivering improved hearing across a wider range of settings. Signia wants to give you brilliant hearing in a stylish device. Discuss your communication needs with your hearing care professional to help determine the performance level that’s right for you. Own Voice Processing (OVP) – most hearing aid users want their own voice to sound natural to them, and this is often overlooked in hearing aid technology – but not with Signia’s Nx platform. OVP gives you back your voice, making it sound like it should – natural. Your voice is processed separately from the rest of the sounds entering your hearing aid and gives you the natural voice quality you want. Directional speech enhancement – enhancing your ability to hear speech in all environments and from all directions. This feature will reduce signals not coming from in front of you, to improve your understanding of speech, even in noisy situations. 3D Classifier – when you move around, your listening is challenged. The 3D classifier feature takes motion information from an app on your smartphone, and adds other information about your environment and communication needs. It will work out the directional state of the speech the wearer is listening to and adjust your hearing aid to give a brilliant listening experience, even while going for a jog! Ultra HD e2e – will give your hearing aid sophisticated directionality for improved speech intelligibility in challenging listening situations, providing data exchange between your ears. This technology includes Spatial SpeechFocus, Narrow Directionality and Speech Quality features. myControl App – this App for your Smartphone will allow you to control, monitor and personalise your hearing aid experience. It will give you information about what’s happening with your hearing aid, in the moment. TeleCare – another application for your smartphone which will allow you to keep in contact with your hearing healthcare provider, who can give you support remotely, in real time. 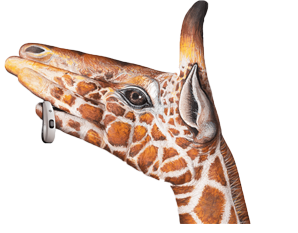 This is game-changing hearwear, transforming the look of hearing aids. Signia created this slim, stylish device after looking at technology style trends in today’s high-tech world. To do this, they had to change the shape of the battery. The Styletto has a pin-rod battery made from Lithium Ion, and is rechargeable. The hearing aid itself is available in three premium style colours – giving this hearing aid a jewel-like quality. You can choose between the following finishes on your Styletto – dark granite and silver, cosmic blue and rose gold, snow white and rose gold. The Styletto uses the Nx platform giving wearers amazing features such as OVP, Ultra HD e2e and rechargeable battery. So the Styletto is your hearing aid when you want something that looks beautiful, will give you brilliant hearing, and is easy to use. Don’t forget the ease of rechargeable batteries and charging case, giving you three days of charge, without needing an outlet to power up your hearing aid. This BTE hearing aid has a lot of options, including a power model (Motion 13P Nx), and a rechargeable option (Motion Charge&Go Nx). The Motion Nx is ergonomically styled and available in all three Signia performance levels. It has all the Nx platform features including Own Voice Processing, Ultra HD e2e and Bluetooth connectivity. 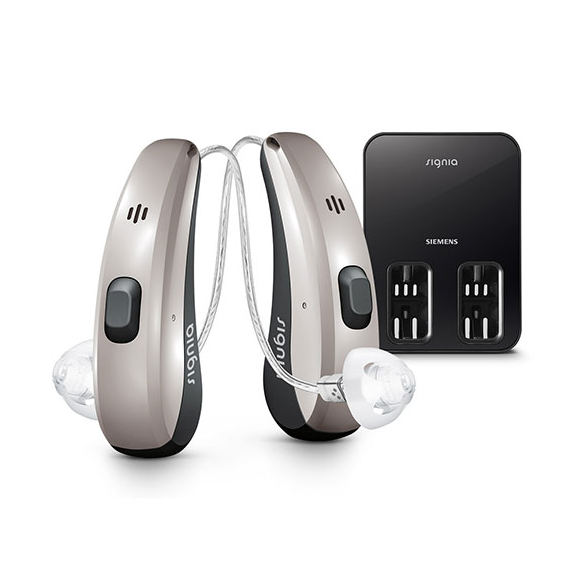 This hearing aid has been proven as the most reliable and robust hearing aid on the market today. 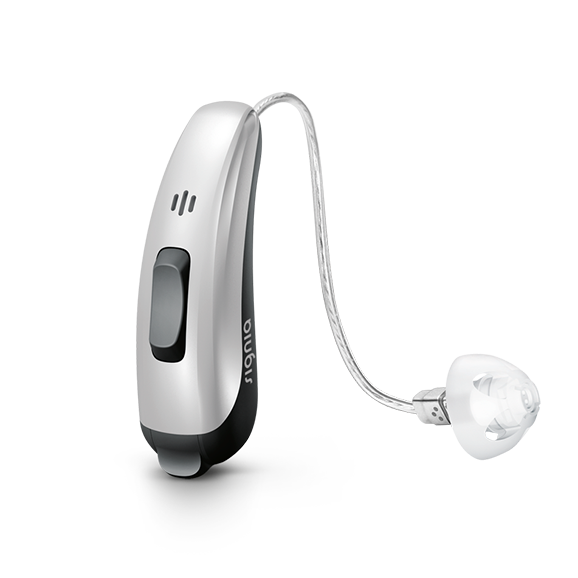 It is easy to use and covers mild to severe hearing ranges, with the Motion 13P Nx being suitable for the severe to profound hearing range. The rechargeable model has no moving parts, increasing its ‘robustness’ and gives you flexibility with battery power as you can charge the charger, as well as your hearing aids! If you like getting away from it all this provides a great option for you. You can stream callers from your smartphone, stream music and TV and make use of the myControl App to change your hearing aid settings in any of the Motion Nx models and it is your hearing aid if you want a robust hearing aid, with brilliant sound features, Bluetooth streaming capabilities and charging on-the-go options. The Insio Nx is a custom ITE or ITC device that comes with Bluetooth connectivity. Its clever design reduces the body absorption effect of Bluetooth streaming by placing the Bluetooth antenna on the faceplate of the hearing aid. It too comes with all the features of the Nx platform (except OVP), giving better speech intelligibility in noisy situations by the use of Ultra HD e2e narrow directionality. 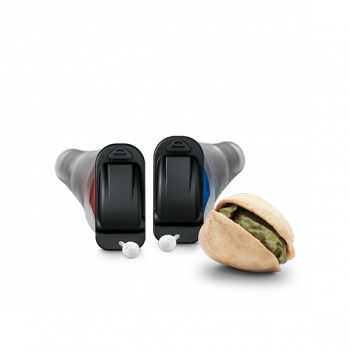 The Insio Nx is your hearing aid if you are after the proven best sound quality and robustness for this style of aid, using Bluetooth streaming, in a custom fit hearing aid.